In this post we we'll share a trick to find Square Root of any perfect square number. In this step we'll group it in segment of two digit numbers, starting from Right Hand Side. 33 and 64 will be two groups. We'll give it a name to make it easy to understand say first part 33 is A (Tens Digit) and second part is B (Units Digit). Lets take first part A i.e. 33. We need to find largest number whose square should be less than 33. We can find that 5 is the largest no. whose square 25 is less than 33 as square of 6 which is 36 would be greater than 33. Part B is 64, all we need to worry about is the last digit of this number i.e. 4. we need to think of all such numbers from 1 to 9 whose last digit of squared term comes 4. So our unit digit must be either 2 or 8.
to find which number out of these two will be unit digit we need to multiply tenth digit i.e. A = 5 with its successor 6.
we see that 33 is greater hence we'll take higher value from 2 and 8. 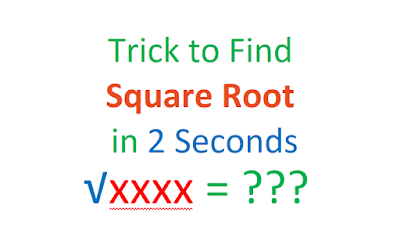 You can watch our Youtube video lesson with many other examples to understand this trick. Below is the video of this Trick.